This week's edition of Raw came live from Wells Fargo Center, Philadephia and we're glad to say that the Fastlane go-home show didn't disappoint. The arena was filled with fans who curiously awaited the show to unfold considering the exciting storylines the WWE has been building for quite some time now. WWE Creative have played all its cards perfectly in order to capture the fans attention as the Wrestlemania approaches. The Fastlane go-home show was filled with drama as the fans got an A-class show. The WWE continues to work on intriguing storylines heading on to WrestleMania. Weeks ago the WWE announced Dean's departure from the company post-WrestleMania 35. The following week Lunatic fringe was pinned by the debutant EC3 and it seemed like the former Shield member was set to depart for real. Things haven't been really pleasant for Dean in 2019 as his heel turn didn't work out successfully for him or the company as the lunatic fringe failed to establish himself as a solid villain on the roster. With the rise of men like Drew Mcintyre, Baron Corbin and Bobby Lashley, Ambrose being the Alpha villain on the red brand seemed like a distant thought. 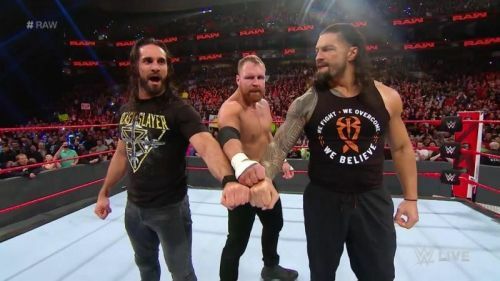 With that said, despite getting pinned for three weeks in a row, it seems WWE Creative are ready to put Dean in a better position hereon as the WWE universe witnessed The Shield reunite this past week on Raw. The trio is set to face Bobby Lashley, Baron Corbin and Drew Mcintyre at Fastlane. Finally, there's some light at the end of the tunnel for Dean Ambrose whose WWE career seemed like going down the hill. With that being said, it's clear that the WWE board considers Dean an important part of their plans and the lunatic fringe may stay with the company. Giving Dean a face turn is what the WWE Universe would heartily welcome considering his connection with the fans. Setting things up, Dean Ambrose may stay after all.